It’s natural for people to want things to turn out well in the end, both in life and, apparently, afterwards. Roughly seven-in-ten (72%) Americans say they believe in heaven — defined as a place “where people who have led good lives are eternally rewarded,” according to the Pew Research Center’s 2014 Religious Landscape Study. These percentages are little changed from 2007, when Pew Research Center’s first Religious Landscape Study found that 74% of Americans believed in heaven, and 59% believed in hell. Among religiously affiliated Americans, the belief that there is a heaven is even more widespread, with 82% holding this view, about the same as in 2007. Belief in hell has held relatively steady in this group. Compared with non-Christians and the unaffiliated, U.S. Christians are more likely to believe in both afterlife destinations. The existence of heaven is almost universally accepted by Mormons (95%) and members of historically black Protestant denominations (93%), as well as by about eight-in-ten or more evangelical Protestants, Catholics, Orthodox Christians and mainline Protestants. Meanwhile, 82% of evangelical Protestants and members of historically black Protestant churches say they believe in hell. Somewhat fewer Catholics, Mormons, mainline Protestants and Orthodox Christians also hold this view. Muslims are similar to Christians in views of an afterlife, with 89% saying they believe in heaven and 76% believing in hell. Among other non-Christians, however, beliefs that there are places of eternal reward and punishment after death are not as widely held. Roughly half or fewer of Hindus, Buddhists and Jews believe in heaven. And roughly a third or less of Buddhists, Hindus, and Jews believe in the concept of hell. Not surprisingly, far fewer religious “nones” — a group that includes atheists, agnostics and people who say their religion is “nothing in particular” — say they believe in the existence of heaven and hell. Fewer than four-in-ten (37%) “nones” say they believe in heaven , while 27% believe in hell. 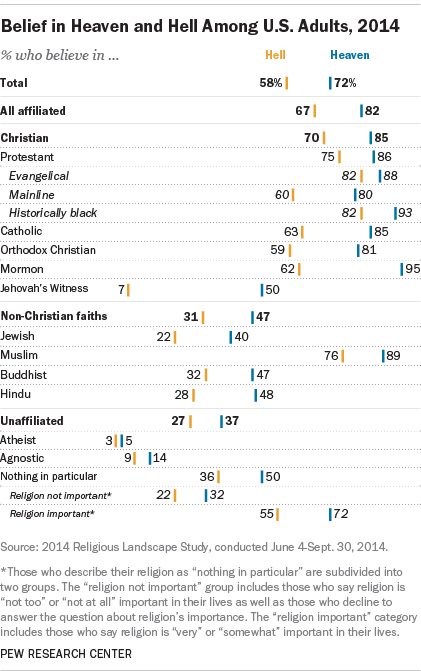 An exception are those “nones” who say religion is important to them. Their views are similar to the general public’s, with 72% professing a belief in heaven. They also are roughly twice as likely as religiously unaffiliated people in general to believe in hell (55% vs 27%).